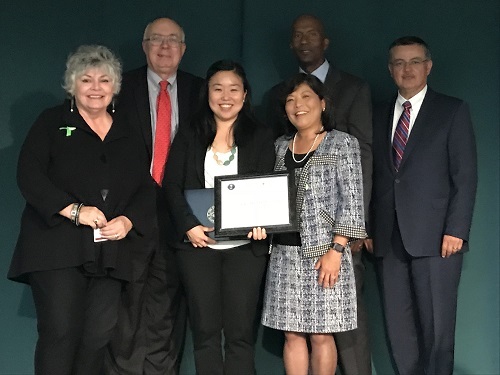 Joyce Chu, Ph.D., an associate professor at Palo Alto University (PAU), was honored at the 7th Annual COMMUNITY HEROES Awards luncheon Wednesday, May 2, at the San Jose Masonic Center. 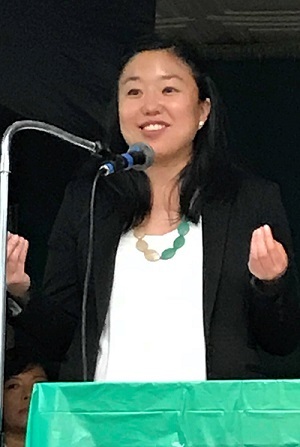 Sponsored by the Santa Clara County Behavioral Health Board, Dr. Chu received the ‘Educator Community Hero’ award, recognizing her work as a clinical psychologist in advancing the assessment and prevention of suicide for ethnic minority and LBGTQ populations, particularly among Asian Americans. Dr. Chu is the Faculty Chair at Palo Alto University, co-leads the Multicultural Suicide and Ethnic Minority Mental Health Research Groups at PAU, and is also Director of the Diversity and Community Mental Health (DCMH) emphasis which trains future psychologists to work with underserved populations in the public mental health sector. Under her leadership, the DCMH emphasis received awards for innovative practices in graduate education in psychology by both the American Psychological Association Board of Educational Affairs, and the National Council of Schools and Programs of Professional Psychology. Dr. Chu also co-directs PAU’s Center for Excellence in Diversity, which was founded in 2010 by Dr. Stanley Sue. Dr. Chu earned her B.A. and M.A. in psychology at Stanford University, her Ph.D. in clinical psychology from the University of Michigan, and did a postdoctoral fellowship at the University of California, San Francisco. Dr. Joyce Chu, center, and from left: Toni Tullys, Director Santa Clara County Behavioral Health Services Department; Joe Simitian, president Santa Clara County Board of Supervisors; Dr. June Klein, Palo Alto University VP for Business Affairs and CFO, and Santa Clara County Behavioral Health Board Member; Gary Miles, Ph.D., Santa Clara Behavioral Health Board Chair; and Rene Santiago, Deputy County Executive, Santa Clara County Health and Human Services.